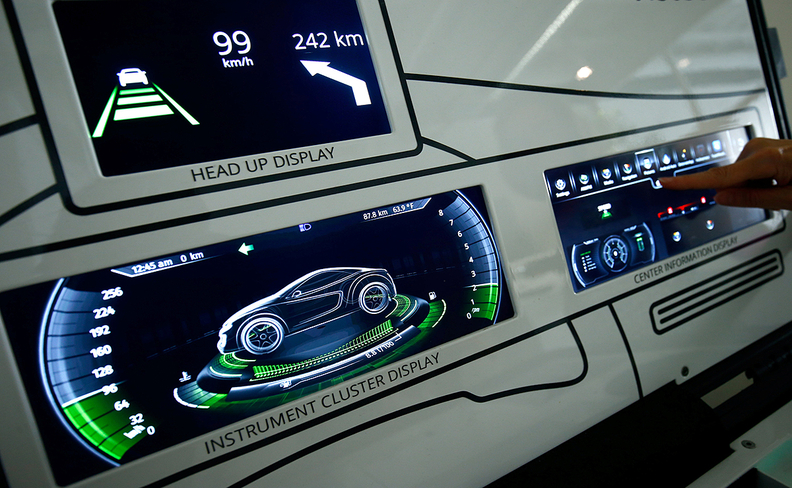 A "SmartCore" dashboard is seen at Visteon's technical center in Karlsruhe, Germany, last week. SAN FRANCISCO -- Peer at the instrument panel on your new car and you may find sleek digital gauges and multicolored screens. But a glimpse behind the dashboard could reveal what U.S. auto supplier Visteon Corp found: a mess. As automotive cockpits become crammed with ever more digital features such as navigation and entertainment systems, the electronics holding it all together have become a rat's nest of components made by different parts makers. Now the race is on to clean up the clutter. Visteon, based near Detroit, is among a slew of suppliers aiming to make dashboard innards simpler, cheaper and lighter as the industry accelerates toward a so-called virtual cockpit -- an all-digital dashboard that will help usher in the era of self-driving cars. What's at stake is a piece of the $37-billion cockpit electronics market, estimated by research firm IHS Market to nearly double to $62 billion by 2022. Accounting firm PwC estimates that electronics could account for up to 20 percent of a car's value in the next two years, up from 13 percent in 2015. Meanwhile, the number of suppliers for those components is likely to dwindle as automakers look to work with fewer companies capable of doing more, according to Mark Boyadjis, principal automotive analyst at IHS Markit. "The complexity of engineering ten different systems from ten different suppliers is no longer something an automaker wants to do," Boyadjis said. He estimates manufacturers eventually will work with two to three cockpit suppliers for each model, down from six to 10 today. One of Visteon's solutions is a computer module dubbed "SmartCore." This cockpit domain controller operates a vehicle's instrument cluster, infotainment system and other features, all on the same tiny piece of silicon. So far this year, the supplier has landed two big contracts for undisclosed sums. One, announced in April, is with China's second-largest automaker, Dongfeng Motor Corp. The other is with Mercedes-Benz, Reuters has learned. Mercedes did not respond to requests for comment. Another unnamed European automaker plans to use the system in 2018, according to Visteon. It's a major turnaround since Visteon was spun off from Ford Motor Co. 17 years ago. Visteon filed for bankruptcy protection during the Great Recession in 2009 before emerging a year later. It also endured boardroom drama about its strategic direction in 2012, resulting in the departure of then-CEO Don Stebbins. Independent board members had pressured Stebbins to streamline the company. Since then, Visteon decided to go all-in on cockpit electronics, having shed its remaining automotive climate and interiors businesses in 2016. The bet so far is paying off. The company secured $1.5 billion in new business in the first quarter, helped by growth in China. Visteon's stock price is up more than 50 percent over the past year. "You have to be changing and adapting fast. If not, you're not going to keep up in this market," said Tim Yerdon, Visteon's head of global marketing. "It's about reinventing yourself to stay ahead." Visteon's makeover hints at the coming battle between suppliers fighting for real estate in the digital cockpit. The trend is already triggering acquisitions, as companies look to boost their offerings to automakers. Visteon in 2014 bought Johnson Controls' electronics business, which was also developing a domain controller. In March, Samsung completed its $8-billion purchase of infotainment company Harman. France's Faurecia, a top seating and interiors supplier, last year purchased a 20 percent stake in Paris-based infotainment firm Parrot Automotive SAS in a deal that could make Faurecia the biggest shareholder by 2019. Deal-making in the wider automotive sector has been at a fever pitch over the past two years fueled by the race to develop autonomous vehicle technology. Activity in the sector was worth $41 billion in 2016, according to PwC. Analysts say German automakers are taking the lead in consolidating functions within the dashboard. Audi was the first to debut a virtual cockpit last year that combined its instrument cluster and infotainment system. Streamlined dashboards can lead to cost reductions for manufacturers, who can save as much as $175 per car with an integrated cockpit, according to Munich-based management consulting firm Roland Berger. They can also help with fuel efficiency. That's because vehicles are lighter when there are fewer behind-the-scenes computers, known as electronic control units (ECUs). Vehicles today contain 80 to 120 ECUs, numbers expected to fall sharply in coming years. But perhaps the biggest motivation for fancy cockpits is sales. Drivers accustomed to the seamless technology of their smartphones are finding today's dashboard offerings clunky and non-intuitive. A J.D. Power study released this month found the most complaints from new vehicle owners stemmed from audio, communications, entertainment and maps systems. Better cockpits could prove crucial to attracting younger consumers, who are not showing the same enthusiasm for cars -- or even driving -- that their parents did. Research company Mintel found that 41 percent of millennial car buyers are interested in having the latest technology in their vehicles. Disjointed dashboards "are one of the most noticeable gaps in user experience -- what you see right in front of you," said Andrew Hart of UK-based consultancy SBD Automotive. On many car models, he said, audible warning systems to alert the driver to a potential collision are not in sync with the radio, meaning your favorite song could drown out the warning beep. "That's a crazy example of something when you don't consolidate ECUs," Hart said. Industry watchers say this and other safe-driving features are among the systems ripe for integration. Additional targets include rear-seat entertainment systems and so-called heads-up displays that project data such as the car's speed onto the windshield for easy viewing. Back in Detroit, Visteon says it is in talks with carmakers in China and Europe for its domain controller, a technology it hopes can give it an edge over rivals such as Delphi, Robert Bosch, Continental and Denso. While it isn't clear who will prevail, electronics suppliers are seeing their products take on new importance as vehicles become more connected. Five years ago, the dashboard was "a plastic molded cockpit that we stuffed electronics into," said Yerdon, Visteon's marketing chief. "Now it's more about an electronic architecture that's experience-driven, and we mold plastic around it."